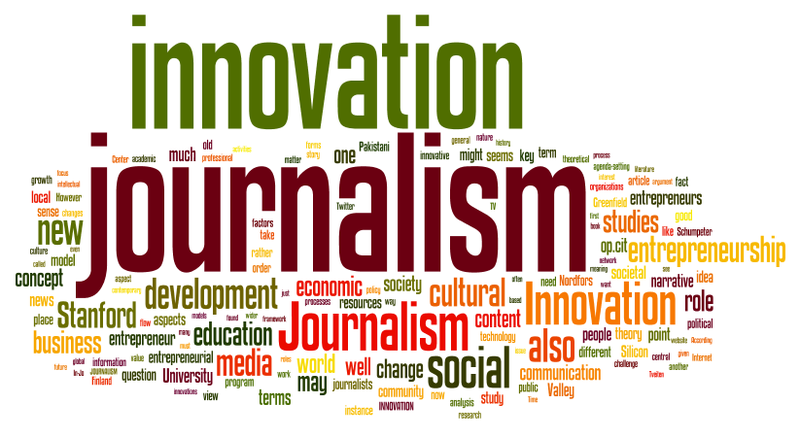 The journalism is Innovation…An attempt to bring out the truth! At times we believe so much in innovation that we configure our own stories which are far away from reality. India offers a huge market of news channels and newspapers world-wide. There are approx 1, 00,000 publications registered with the Registrar of Newspapers of India. Our human mind is greatly evolved and especially it is biased towards negativity. May be it is a reflection of flight, fright response that develops very early in species in order to protect our own selves! or we grow up inclined towards negativity so much that the positive attributes are usually taken for granted! That is one of the main reasons that the journalism is biased towards the negative updates rather than mentioning about the positive developments that happens in society. The market is huge and so is the competition between the peer groups…the urge to get recognition early in the life and haste of being popular in the industry, ultimately drives towards twisting and manipulation of the facts! The being judgmental and narrowed up vision, biased attitude often leads to screwing of facts to present events as sensational as BREAKING NEWS! The same family …the same news but the reason of conversion is phenomenonly different! The same news with different angles certainly makes readers doubt on the authenticity of the same! The video clearly depicts that the farmer is being trained by the reporter to act as if he is committing suicide to raise an alarm amongst the society and clearly it is manipulation of the reality. In India the way a news is published depends more upon the caste or religion …These are deliberate attempts to make news more sensational! However, it leads to enhance communal tension between the groups! The danger of provoking riots is always there! A bunch of passengers boarded a train from Delhi to Mathura and attacked three boys, including Junaid, following an altercation over seats. An Unfortunate incident where the alteration that started over seat lead to death of a muslim son; anyone who has committed the crime should be punished but the incident was given a communal twist. It was total insensitive on the part of media who just sensationalised the whole issue to get gains even when the family and police said that the basis of alteration was the seat. 2. In the first case (Image Below) the Guy concerned is muslim and girl is Hindu while in the second its vice- versa. However there is substantial difference by the way, the stories are covered! An obvious attempt to enhance communal tension! Since the Man was Chandan Gupta and he was killed by muslim mob while he was trying to hoist tricolor flag on republic day- the story is just communal clash! yet another example of the news with different visions…. V. Reporting with a TWINE…. It may be interesting to give a little twist to the actual words which changes the meaning and observing the reaction of the public! but sooner the later it tarnishes the authenticity of the news channels! Undoubtedly it lead to division of india into two groups- one who supported UAE’s generous help and the other who did not; which subsequently lead to the heated conversations on social media and different whatsapp groups until the reality surfaced that it was nothing but a made up story! There were attempts to show Central Govt Inferior! Recognition of any INDIAN on an international platform is a matter of pride;ironically media was actually questioning UN Credibility by asking whether our PM actually deserved it or not! with this logic we should not ever have metros in the city because that reduces the job options for the auto drivers and cab drivers! On International Platform too, the charismatic personality was lauded with loads of respect and love. DAWN.COM- reported as ‘Vajpayee, partisan of peace with Pakistan, dies’, where it said that Vajpayee was lauded in Pakistan as a ‘sincere peacemaker’. The New York Times described Vajpayee as a resolute politician and who, as ‘India’s prime minister from 1998 to 2004, ‘stunned the world by ending a decades-old moratorium on nuclear weapons tests’. Journalism is the fourth pillar of democracy; India where we enjoy the largest democracy, this pillar has to be really strong and capable…this pillar brings out the truth and reality to the citizens. What if the news we are reading is more so focused on bringing out the hatred in us towards other communities and our own country in general. It can eventually affect the developing mind! Journalism shouldnot loose its authenticity at any cost. It should be a REALITY-CHECK and NON-BIASED! SABARIMALA- A Quest towards Women Empowerment? Really good one pooja….. Some one should come with points about these facts which nobody discusses in public platform….